The WSDOT TAMP is available here. The Washington State DOT TAMP documents the state's pavement and bridge assets and its approach to applying Transportation Asset Management (TAM) principles. This TAMP has been prepared to comply with Federal Highway Administration requirements. 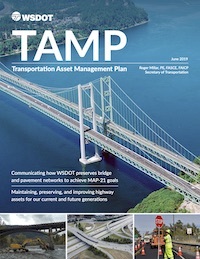 It describes the inventory and condition of the highways and bridges located on the National Highway System (NHS) in Washington, and it describes how WSDOT is managing these assets using TAM principles. Though this version does not contain the Risk Register, the full results of the Risk Register will be completed by June 2019 and included in the June 2019 submittal. This document includes the following sections: Asset Valuation, Current Methods and Tools, Financial Plan, Introduction, Inventory and Condition, Investment Strategies, Lifecycle Management, Objectives and Measures, Performance Assessment, Process Improvements, Regulatory and Legislative Requirements, Risk Management. The asset scope of this document is: Highway Assets.